With public concern growing over illnesses spread by mosquitoes, the Entomology Lab at the Community and Natural Resources (CNR) division of the American Samoa Community College (ASCC) continues its research to better understand these insects with an aim to mitigating their role as carriers of disease in the Territory. ASCC CNR has been doing research and education work on mosquitoes for over two decades. The ASCC CNR Entomology Lab is currently staffed by Entomologist Mark Schmaedick, Research Assistant Metotagivale Meredith, and Entomology Technician Niela Leifi. Collaborators over the years have included the local Department of Health, Environmental Protection Agency, Department of Marine and Wildlife Resources, ASPA, and the US Centers for Disease Control and Prevention. Both local students and students from several U.S. universities have also assisted with this research. The two main species of disease-carrying mosquitoes in American Samoa are both "container-breeding" mosquitoes, meaning their immature stages develop in water that accumulates in containers such as used tires, buckets, cans, drums, ice cream containers, plastic tarps, etc. in and around villages. These mosquitoes are weak fliers with limited flight range, so cleaning up their breeding sites in and around villages can help reduce their numbers and the spread of the diseases they carry. Unlike many other mosquito species, these disease-carrying mosquitoes bite mainly in the daytime. They can be identified by the black and white patterns of banding on their bodies and legs. 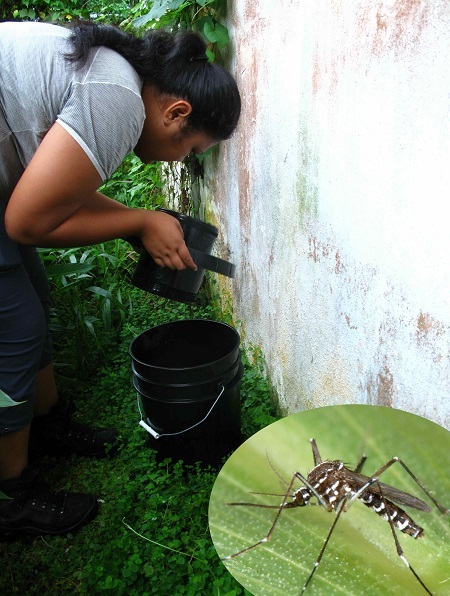 Currently the ASCC CNR Entomology Lab is researching different kinds of mosquito traps to see which is most effective for catching local species. “The disease-carrying mosquitoes here are difficult to catch using the kinds of traps effective for other species,” explained Schmaedick, “so we have to test out other kinds of traps to see what works well here. An effective trap is an important tool for studying mosquito populations because it allows us to capture large numbers of mosquitoes across multiple locations simultaneously and continuously. In addition, effective traps can be valuable tools for studying and monitoring mosquito-borne human diseases such as filariasis, dengue, and chikungunya, because the organisms that cause these diseases can be detected in the trapped mosquitoes. For example, rather than taking blood samples from many people to determine whether or not a certain disease agent is present, we can collect thousands of mosquitoes and test them instead.” Any mosquitoes that have fed on an infected person will likely contain the disease-causing agent, which can then be detected in those mosquitoes. The four types of traps now being tested by the Entomology Lab were developed in the U.S., Puerto Rico, Germany, and Australia to target other species of mosquitoes. “We will see how effective they are for American Samoa's mosquitoes by placing the traps in villages and comparing what mosquito species and how many mosquitoes are caught,” said Schmaedick. “We will also evaluate how practical each trap is for use under our conditions.” Traps use different methods to attract mosquitoes. For example, one contains chemicals that are also present in human sweat. Just as the mosquito thinks it's about to land on a sweaty human, it gets sucked into the trap. Another type of trap contains water to attract mosquito females looking for a suitable container in which to lay eggs. For more information on mosquito research in American Samoa, contact Mark Schmaedick of ASCC-CNR at 699-1575. Information on educational and research opportunities available at ASCC-CNR can be found online at: www.amsamoacnrlg.org.